Welcome to Android Central! 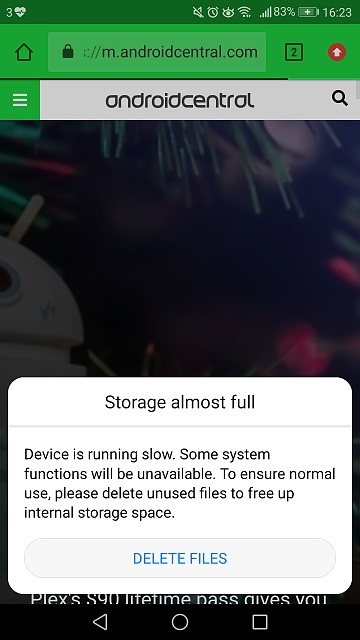 Is there a reason why you haven't tried to clear up more space? You might not be able to get rid of those warning messages until you do. 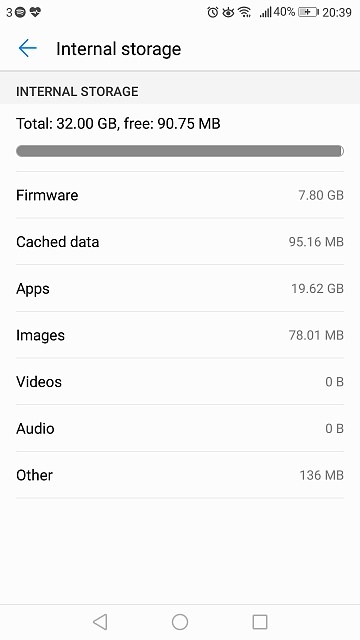 Show us a screenshot of your Settings>Storage menu: http://forums.androidcentral.com/gen...d-central.html. You might also want to install DiskUsage and get a more detailed breakdown on what's taking up your Internal Storage. You probably need to start uninstalling some apps. must be gaming apps consuming lot of space, like asphalt 8/9 or PUBG which are more than 1GB. you may go to apps and try moving their data to SD card or set your default storage to SD card. hi.. i have isntalled wrong firmware in my mobile. Internal Storage seems to have filled itself back up again after deleting some media? Malware? Wifi hotspot, "No internet, secured". Voda. Huawei P10. Android 8.0.0. Windows 10 laptop.